In short, Ant-Man was more enjoyable than I thought it’d be. In fact, it’s excellent. While Avengers: Age of Ultron almost collapsed underneath its sheer girth with all the characters and plot threads, Ant-Man benefits greatly with just four core cast members, all new to the Marvel Cinematic Universe (MCU). It works very well as a stand-alone film, just like Guardians of the Galaxy. There are nods to the other movies and of course its original source material, but they don’t confuse audiences who aren’t a follower of this mega-franchise. Scott Lang (Paul Rudd) is a former systems engineer who just left prison after serving a sentence for petty theft. After he discovers a suit that allows him to shrink in size but also become physically stronger, he becomes a part of a “save the human race from their own demise by stopping a weapon getting into the wrong hands” plot that becomes much bigger than him (ha!). Guiding him is scientist Hank Pym (Michael Dougles), who became the original Ant-Man in the ‘60s after mastering the [INSERT SCIENCEY-FICTIONEY STUFF] that makes the shrinking ability possible. His estranged daughter, Hope Van Dyne (Evangeline Lilly), along with his former protégé, Darren Cross (Corey Stoll) have taken over Pym’s company and pushed him out. There are fantastic side characters, but these are the four that matter. During this heist movie, arguably the biggest theme is family, especially with father figures. Lang’s wants to be the hero his young daughter thinks he is (she’s currently in the care of Lang’s ex-wife and new fiancé), and Pym has a strained relationship with his daughter and Cross, who Pym once saw as “the son he never had”. Cross despises Pym yet at the same time wants his approval so badly, that he’s willing to revive his mentor’s dangerous secretive technology. All the personalities are brilliant. You root for Lang, because he made a terrible mistake and wants so badly to make everything right. Cross’s demeanour may be one of the most bloodcurdling in the entire MCU, yet he’s not some crazy super villain trying to conquer the world. Pym’s arc with his daughter becomes the most satisfying in the picture, and both are just bad arse characters. 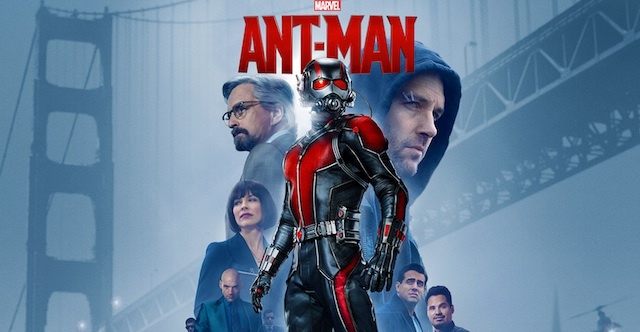 You may be sick of origin stories at this point, but I doubt most non-comic book fans had even heard of Ant-Man, so watching him learn how to shrink in size, control ants and attack targets so much larger than him is simply thrilling to watch. The script and ideas are on point, and the sight of a vicious fight scene at microscopic size on a Thomas the Tank Engine train set was hilariously awesome. Despite the stakes of the heist hinging on a potential dangerous weapon, the characters are so good you just worry whether they get out alive, rather than if we all do. Ant-Man is a superb motion-picture. For some, the superhero featured in this film seems a tad lame, but trust me, just go see the movie and you’ll change your mind. A great script, great cast, great action and a running time that doesn’t drag on at all, just go see it.